New Delhi : Indian Air Force pilots have introduced their humanity by saving the lives of a pregnant woman, who had hanged between Jammu and Kashmir's snowfall recently. 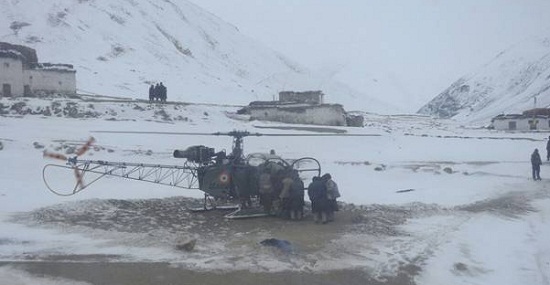 Indian Air Force pilots carried her to a hospital in Leh by Cheetah helicopter. This pregnant woman was trapped between the snowfall in Ladakh. Thirty-five-year-old Stanzin Laton, a resident of Kurgiak village in a valley of Shinkun-la pass, is three-months pregnant. Laton was suffering from suffering from eyesight loss and dysphagia, a condition which causes difficulty in swallowing. After coming to know about Laton's condition, the Air Force unit immediately undertook an evacuation mission. The state is currently experiencing an intense spell of cold wave, with temperatures nosediving to below zero. The region also received snowfall in the last few days. The weather in the Kurgiak Valley was deteriorating with the cloud base lowering further, stated a release from the Indian Air Force. The terrain was completely snow-bound and the fading light due to the clouds increased the chances of disorientation. After assessing the weather condition, the formation got airborne within 30 minutes, with Wing Commander S.I. Khan and Flight Lieutenant Pravin in the lead aircraft, along with Wing Commander S.K. Pradhan and Squadron Leader A. Bedekar as No 2. The crew successfully negotiated the valley chose a landing site close to the village, which was sloping but manageable. The crew located the village successfully and picked up the pregnant woman. Notable, Leh, which is on the border of Pakistan and China is snow covered these days and it is very difficult to reach here by road. Therefore, the Air Force is praising by the people for help with this campaign.